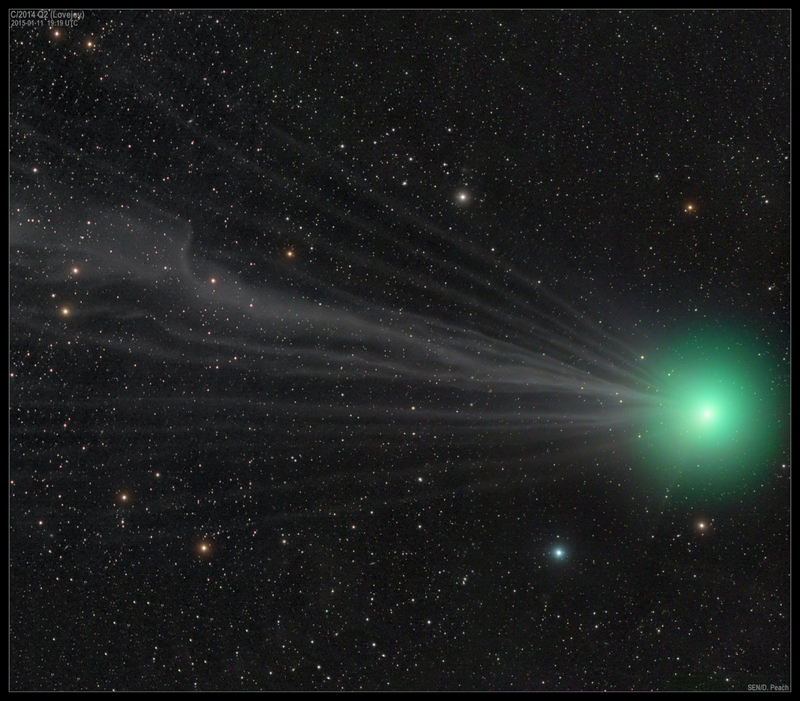 I hope many of you had a change to see and image Comet Lovejoy last month. As anticipated it was a naked eye object when seen under dark country skies. Using the finder chart and simple binoculars, it was even quicker. Lovejoy only has a gas tail that only revealed itself in long exposures. An upcoming photo op will be around the 15 when the comet is in the area of the Andromeda Galaxy and the moon will not interfere. Wow talk about starting off 2015 with a bang. The comet came closest to the Sun (perihelion) on January 30 and is now moving away and will return 8,000 years from now. Moving through the constellations of Andromeda and the rich Milky Way field of Persus and then through Cassiopeia next month, Lovejoy is still putting on a great show. On the heels of last month’s article, let’s move north to Auriga the Charioteer. Capped by its bright star Capella at magnitude zero which is an extremely close double star that is not easy to split, Auriga is home to three fantastic open clusters. Towards the lower part of the asterism we have M38, M36 and my favourite M37. Throw into the mix IC 410 and you have a wonderful place to play with your digital camera and take long expose images. IC 410 is an emission nebula spanning 100 light years wide and lie some 1200 lights years away. Amongst the fine detail of stellar formation are two odd looking squiggles called the tadpoles. Their appearance is a result of the stellar winds blowing from nearby NGC 1893. As mentioned the trio of open clusters is the showpiece of the constellation. 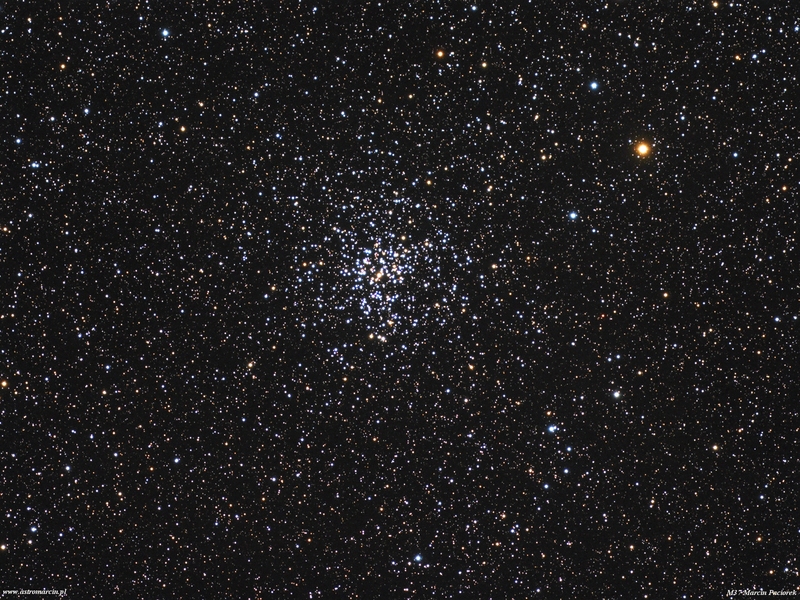 M36, M37 glow at magnitudes 6.3 and 6.2 respectively and might be glimpsed naked eye from extremely dark moonless sites whereas M38 registers at a fainter magnitude 7.4. 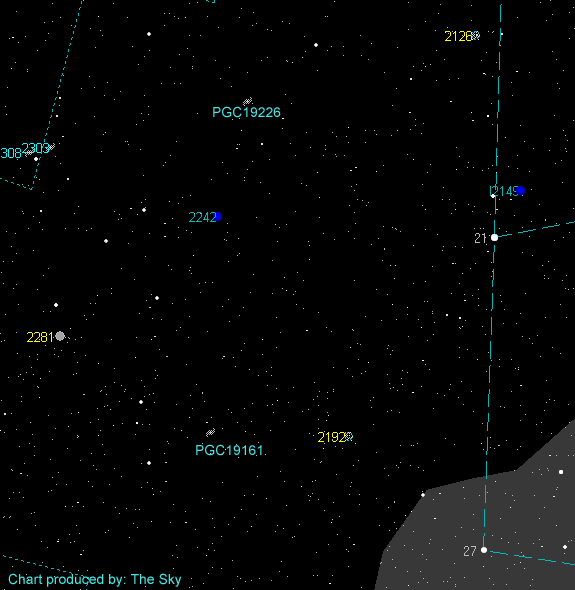 Also close by we have fainter and smaller open clusters such as NGC 1931 and NGC 1907. These open clusters range fro 4,100 to 4,500 light years from us except NGC 1931 and is an estimated 7,000 light years away. This object is actually a nebula surrounded by the group of stars. 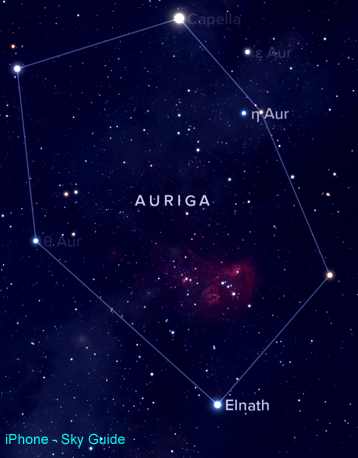 Located towards the top portion of Auriga lie two planetary nebulas. 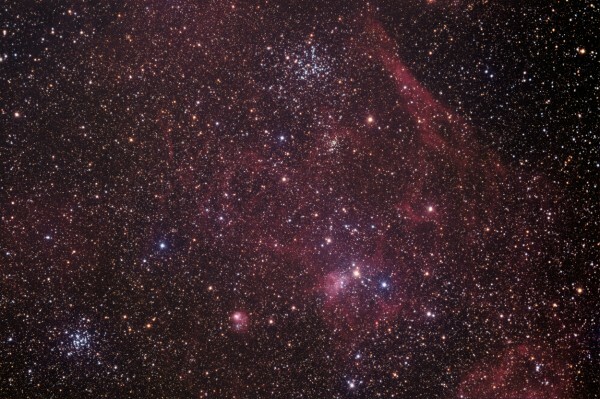 First on the menu is NGC 2242. Located a little more than six degrees from magnitude 2.1 Beta Auriga, this planetary does not possess the twisty spiral shape seen in but a nice round envelope of gas and dust expelled from the dead star. This 14th magnitude object is a definite challenge as one would need at minimum a 10 inch scope. 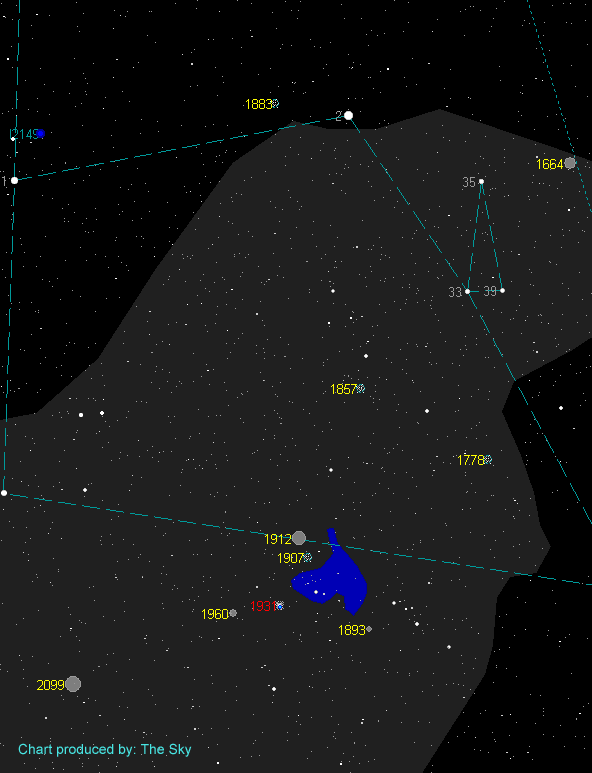 The central star at measured to be magnitude 17.6. Our second stellar corpse is IC 2149. At low power it looks like a typical 11th magnitude sun but the nebulosity reveals itself in higher magnifications. IC 2149 is an estimated 5,200 light years away. Everyone knows the planets of our solar system but many do not know how bright they really are and how easy they are to locate. The two brightest planets are at opposite horizons. Within about 20 minutes after sunset you should be able to see brilliant Venus in the west. It is steadily climbing higher each night while approaching Mars. Venus slides past Mars on Feb 22 with both filling nicely in a wide angle field of view. About 6 p.m. local time look east to spot Jupiter which is at opposition on Feb 6. On that day it will rise when the Sun sets and will only be 36 light minutes away. Saturn can be seen in the constellation Scorpius in the south about an hour before sun rise. The Lord of the rings line up with the four stars that make up the claws of the scorpion. Saturn is located on the top of the line-up and appears yellowish in colour. 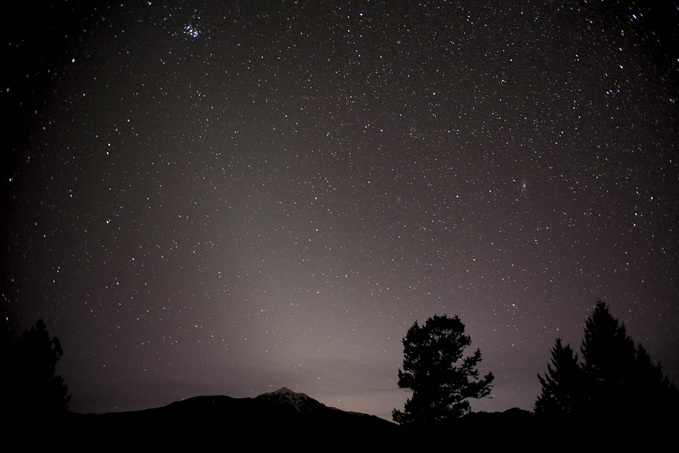 After the full Snow Moon slated for Feb 3 at 23:09 UT, look for the Zodiacal Light in the East after sunset starting from the 5th. We are simply looking at dust particle along the plane of the solar system. 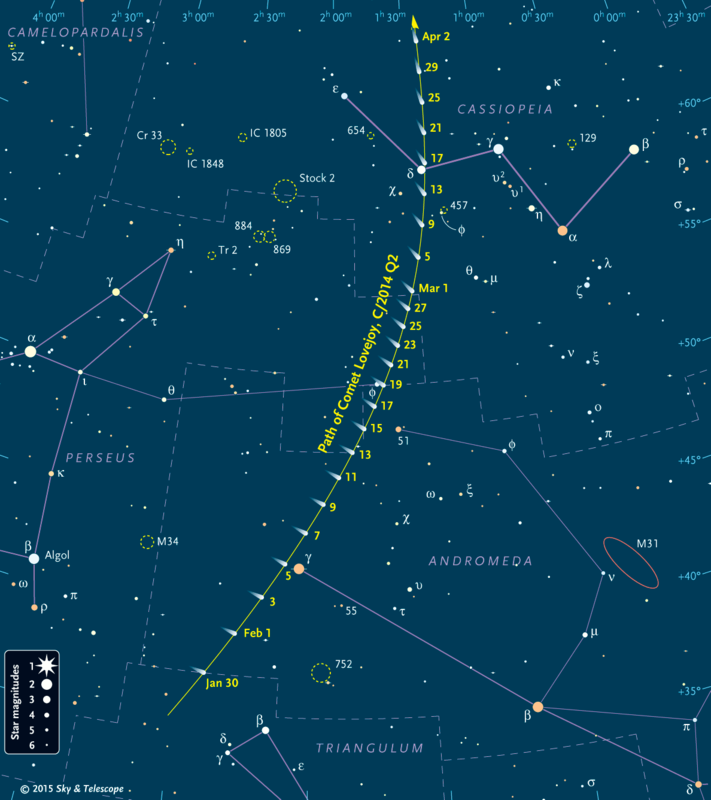 Feb 18 will mark the new moon (lunation 1140) at 23:47 UT.